Discount available! 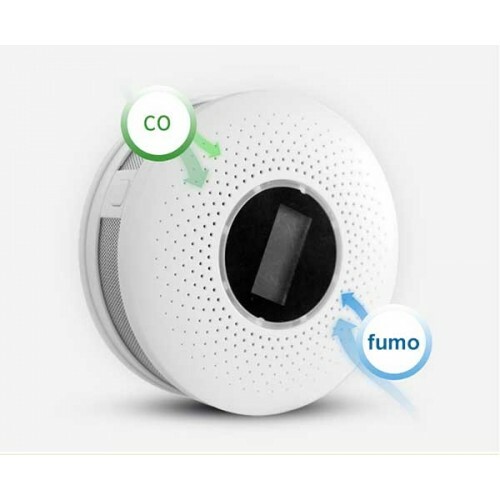 Recommend Smoke and Carbon Monoxide detector to your friends and get your Discount. Carbon monoxide detector and smoke detector in one device. It is able to warn, with two different LED colors combined with as many different acoustic signals, the presence of smoke and carbon monoxide, two potentially fatal threats. The carbon monoxide detector is designed to enter an alarm at an exposure level (CO) more than 100ppm. The smoke detector only indicates the presence of smoke reaching the sensor, it is not designed to detect gas, heat or flames. Wall mounting. The detector has an alarm indicator for empty batteries. Power supply: three 1.5 volt "AA" batteries. Dimensions (mm): diameter 104x39. Complete with wall anchors. The Carbon Monoxide it is a product of incomplete combustion of organic fuels (coal, oil, wood, fuels). It is present in the exhausts of motor vehicles and tobacco smoke. The Carbon Monoxide it is an odorless, colorless, tasteless and poisonous gas. It is toxic because by firmly binding to the iron atoms in the blood hemoglobin it forms a much more stable complex than that formed by oxygen. The formation of this complex causes the hemoglobin to be stabilized in the form of carboxyhemoglobin (COHb) which, due to its allosteric properties, more difficultly releases oxygen to the tissues. This leads to a state of unconsciousness and therefore to death. Even in low concentrations, carbon monoxide can reduce the concentration of oxygen in the brain to the point where the victim becomes unconscious and, in severe cases, dies of asphyxiation. It mixes well with the air, with which it easily forms explosive mixtures and easily penetrates through the walls and ceiling. In the presence of finely dispersed metal powders the substance forms toxic and flammable metal-carbonyls. It can react vigorously with oxygen, acetylene, chlorine, fluorine, nitrogen oxides.